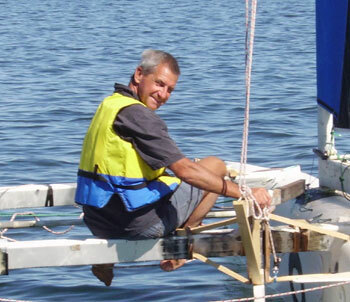 Rob Denney is a New Zealander who started sailing at age 4 and has scarcely been out of a boat since. He has sailed in 7 Sydney Hobarts (2nd on handicap, fastest elapsed time), 6 Brisbane Gladstones (1st on handicap, fastest elapsed time, race record) , worked as a professional yacht skipper, raced and cruised extensively and designed and built some very radical craft, among them a windmill powered catamaran, a precursor of the Formula 40 class and an ultra light 12m catamaran with independently pitching hulls, variable beam and unstayed rig. He owned a successful boat building materials business, was a pioneer in low cost carbon mast building and is an occasional yachting journalist. He built his first proa in 1995 and has been building, sailing and experimenting with them ever since. Rob and Steinar enjoy talking boats, building and sailing. Please email them to discuss your requirements or your project, whether it is an off the shelf or custom design, or an idea which you think has potential.